This is the emotional scene that played out at a Lexington, KY hospital earlier this week, where 49-year-old Lisa Beech is in hospice care. 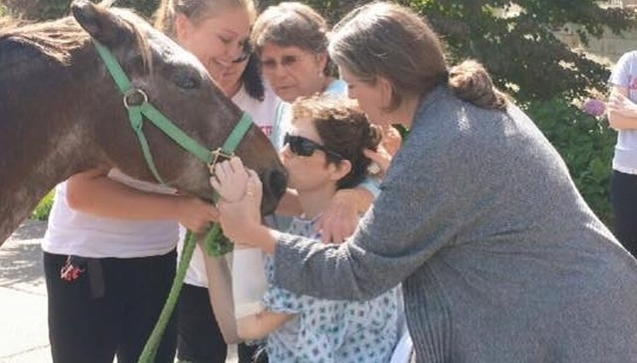 Beech has battled cancer for most her life, but this time, there’s nothing that can be done. 16 years ago my mother took a chance on saving a scraggly Appaloosa pony. She always thought he was such a blessing because he helped me in my biggest times of need. She loved him so much and always told me she dreamed of ares Appaloosa pony as a kid. Little did she know that one day that Appaloosa pony would save her. He cannot give her more time on her life… But he can give her happiness, I truly believe that for the 15 minutes she got to spend with him, he saved her. For 15 minutes she got to be normal again. I will never, ever, be able to repay him for the joy he gave my mother, and my family, today. Knowing that Jake would want to say goodbye to his friend in her final days, Sturgill hatched a plan to have him come to her. The touching reunion was a surprise to the horse as well, who seemed to somehow understand his friend would be leaving him soon. "He definitely knew exactly what was going on. He knew this would be the last time he sees her." Only my Daughter and Lisa Beech's Daughter could pull this off. 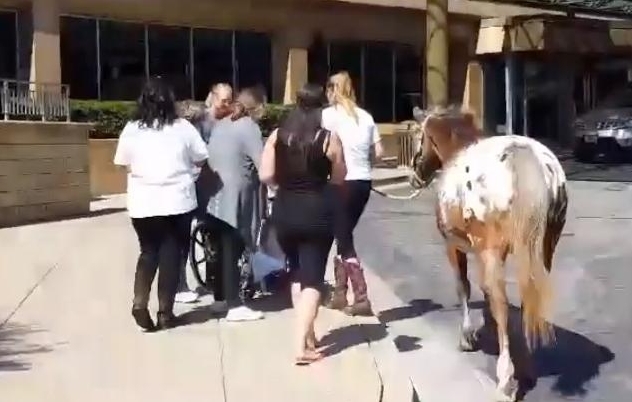 Responses to "Horse Visits Hospital To Say Goodbye To His Ailing Owner "
Lovely and touching video. Thank you for giving them both this beautiful moment.